Click here or on the book to read it online. To search the book, go to page 1 (not the indexes or content pages), type your key word into the search box and click GO. A list of pages comes up where that word was found. Click on any one to go to that page. 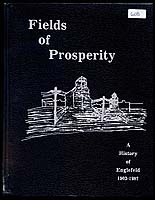 New (2011): Watch an 8 minute video on Englefeld revealing some of its history. click here to send an emailDOT . Click the DVD label to see some of the pictures of the old churches that are on the DVD. Click here to see some early pictures of Englefeld found on the Prairie Towns website. 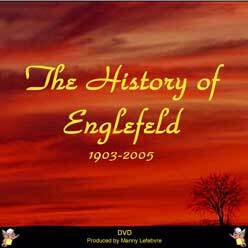 A narrated movie of Englefeld's history from 1903 to 2005 is now available. It takes you through the changes that have occured in Englefeld through the years in chronological order. This DVD or the church history DVD are available for $10.00 each. Please add $5.00 if you want it (them) mailed to you. Both are available by contacting Manny Lefebvre (see above). Special thanks to all those who contributed information, pictures or video footage to this project. To celebrate Saskatchewan's 50 years, in 1955 the school students interviewed some of the Englefeld pioneers and "old folks". The information was compiled into a booklet which availalbe to read at the Englefeld Library. You can also click here or on the picture to read it online. View a list of the mayors and councillors who have served on our village council. 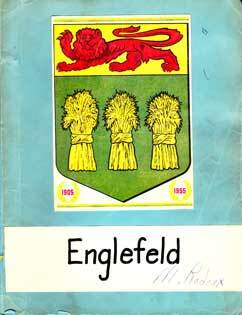 Ever wonder about the spelling of Englefeld? Check out the letter that Ed Wacholtz received in 1987.